Volkswagen, a German company, is part of the Volkswagen Group, which own not only this brand, but several others like Audi, Lamborghini, and Porsche. It is likely the largest auto manufacturer in the world. 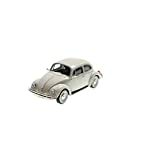 Volkswagen is known for the Beetle, Passat, and the micro bus. They are leaders in innovation and a model builders favorite.